Ability to register a dog with NATE, and to compete with your dog in NATE trials. Access to the full Competition Handbook. Trainers may submit a request to be listed as a treibball trainer on the website. 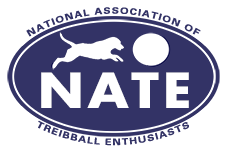 A dog's owner must be a NATE member in order to register their dog to compete in NATE events. Membership levels are: Individual (adult), Youth (under age 18), and Joint/Family. Membership is for twelve (12) months from the day you join. Please indicate below your preferred level of membership, and if you are renewing a current membership. At the end of the membership application, you will have an opportunity to pay online or contact us to arrange offline payment. Your membership or renewal will be activated upon completion of the membership form and receipt of payment. Within 48 hours, you should receive an email with your membership ID number; at that time you may register your dog on our Dog Registration page. Joint/Family - $40.00 (USD) Subscription period: 1 year No automatically recurring payments Assumes two adult members at the same address. Youth Membership - $15.00 (USD) Subscription period: 1 year No automatically recurring payments Under 18 years old.